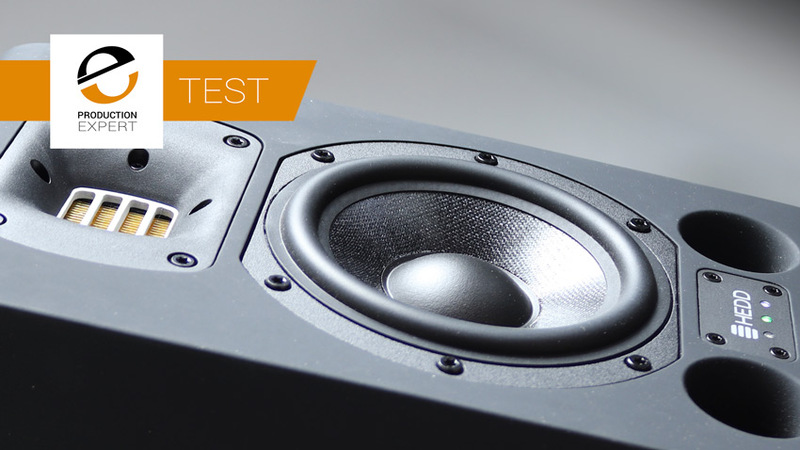 Production Expert | HEDD Type 05 - Monitors With An Extra Feature. How Would You Use Dante Monitors? HEDD Type 05 - Monitors With An Extra Feature. How Would You Use Dante Monitors? Regular readers of the blog will be aware that I'm a self-proclaimed enthusiast for all things AoIP and when I heard of HEDD's plans for a range of monitors with optional "bridge" modules which expand the available IO to include Dante I knew I had to check out a pair. That was quite some time ago but after far too long I've finally spent some time with these monitors. Looking at the available monitors out there in the market it's pretty clear that while there is an example of pretty much every practical arrangement of drivers in a box that can be imagined, the most popular format is the two way ported nearfield with a 5-6" bass driver. There's a good reason for that. This format hits the sweet spot between performance and price and any offering from a company in this part of the market has to extremely good to survive in this crowded and very competitive area. So how does the HEDD Type 05 stand up? The most notable physical feature of the HEDD range is its use of AMT tweeters. Popularised by Adam, with whom HEDD share some heritage, the Air Motion Transformer is an extremely clever alternative transducer design. The gist of it is that unlike other electrodynamic transducers it isn't pistonic - it doesn't push and pull the air with the familiar in and out motion of a "normal" loudspeaker. Instead it more like the folded bellows of an accordion and because of this it gains what I can only describe as a mechanical advantage over the air it is pushing. Instead of there being a 1:1 relationship between the motion of the tweeter diaphragm and the air, the relationship is closer to 4:1 - a big advantage. If you want to know more about this design read the page about the ATM on the HEDD website. I've previously spent very little time with ATM loaded monitors and I expected the top end to be the most striking thing about the sound but actually I was struck by the bass. The cabinets are comparatively large for a 6" driver equipped monitor but are still only 12"x7"x9". They are covered in an unusual rubberised finish which I'm sure would be very scratch resistant but does hold on to dust (maybe that says more about my studio than it does about these monitors...). Back to the bass, these cabinets are front ported (which is a good thing with me) and while they don't defy physics, they are 4dB down at 50Hz and things disappear rapidly after that, they present the bass they do have very well. Small, over-ported speakers are a pet hate of mine and have put me off reflex monitors for years but when done properly the porting doesn't make itself obvious and while my regular Genelecs, because of their matched subwoofer, put out useful bass down past 40Hz, because of the band-pass design of the sub the bass is inherently rather slow. These little HEDDs have an appealing bass character because the bass is in time with the rest of the music. So do the AMT tweeters impress? Well yes. The top end is sweet without being too bright but it doesn't draw attention to itself. Listening to some known tracks (don't worry, this isn't going to turn into a HiFi magazine review...) the impression wasn't anything out of the ordinary, it was all there, it sounded nice. There is nothing as revealing as an AB comparison so I set them up with my ancient Genelec 1029a/1091 system I've had for most of 20 years. I expected the HEDDs to do well. I've been putting off replacing these monitors for years and while I know the Genelecs very well I'm very aware that technology has moved on. A/B-ing between them wasn't good news for my old Genelecs. By comparison the HEDDs were uncoloured with depth and headroom, interesting considering the amplifiers are similarly rated and the monitoring level wasn't high. In a news piece from last year I reported on the HEDD Lineariser plug-in. A clever plug-in which corrects the frequency and phase response of these all-analogue monitors but rather than using built-in hardware to do this correction it uses the computing power of your host computer. I've tried this simple but very effective plug-in and can report that it works exactly as described and at the expense of some latency, which isn't an issue when mixing, it makes some already good monitors just a little better, it's subtle but its definitely better. The Lineariser is available as a free download on the HEDD site. OK, so the HEDD Type 05s are a thoroughly respectable listen which present a very likeable sonic impression and having mixed on them I've found them revealing in all the right ways. In fact I felt at home on them almost straight away. So what about this Dante business? I wanted to try out some Dante monitors as I'm no stranger to Dante gear but I've been a little confused about what using Dante monitors would be like. Dante is a protocol which allows easy transport of audio streams across a network and unlike AES67 also looks after network discovery but it doesn't support device control and so doesn't offer any way of controlling the level of your monitors. Software only control of speakers (or headphones) makes me nervous! Installing and setting up the Dante bridge card was straightforward. The card has an RJ45 network port and an analogue out on XLR and the idea is to install one Bridge card per pair of monitors and to patch to the analogue input of the other speaker using this analogue out. Once all the Dante peripherals were running at the same sample rate running audio through them was a easy as patching them on the cross-point matrix in Dante Controller. How Is Having Dante Useful On A Pair Of Monitors? I'll be the first to say that if you have one pair of monitors next to your audio interface then there isn't anything to be gained from running them over Dante. The Bridge cards are an option for a reason. The tangible benefit of AoIP is in distribution and if you don't need to send audio to somewhere else, or distribute multiple copies then there isn't really any point. The application in which I'd see this Dante option as a real benefit is in distributing audio around a multi room facility. In commercial audio these speakers would be ideal but a familiar example of applications where this option would be invaluable are for playback monitoring in a live area or recreational area in a bigger studio, without any need for audio tie lines, anywhere where there is CAT5e cable installed will work. In a post from 2016 I reported in the plans for a range of bridge cards, looking at the HEDD site today only the Dante card is currently available. Other options were AES67. AES3, USB and a wireless option. The wireless option is particularly interesting to me as a quick and efficient way for clients to play examples directly from their phones through the studio monitors could be very useful. These days having a mini-jack available in the studio probably isn't going to work in all cases. Since I've been working in my current room, a little over 12 months, I've never had a second pair of monitors in here and the Type 05s have brought into sharp focus the fact that some issues I've had which I've attributed to the room are in fact partly due to shortcomings in my monitoring. 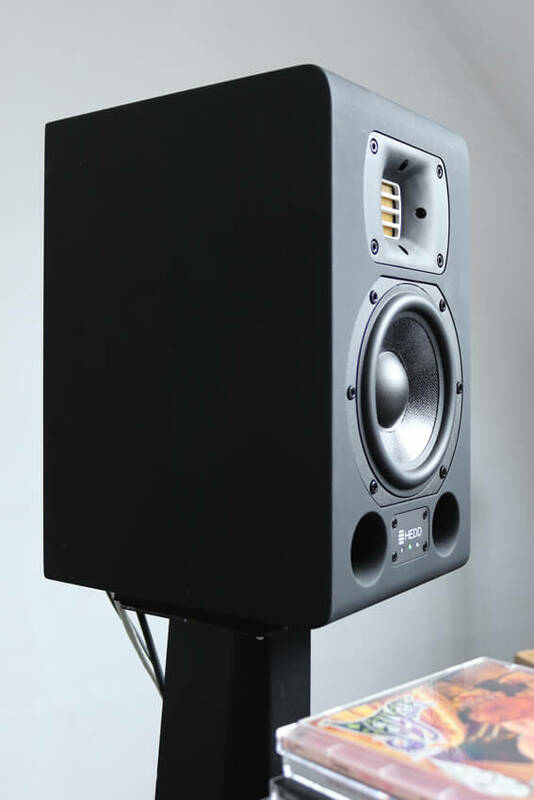 The Type 05s have given me the push I've needed to give some serious thought to upgrading my monitoring, and given the fact that these very capable monitors are currently retailing in the UK for under £750 a pair It might even be with some of these. The 3 way Type 20 looks nice - Oh dear, what have I started?